Returning to my own work, The Kasparov Paradigm is a thriller about an investigative journalist who is charged with unlocking a deadly secret contained in a famous game of chess. One concern in making the pitch, was that chess could be considered too dry a subject to spark sufficient sales volume. However, the book isn’t really about chess. It is a modern-day morality play about a delinquent Irish city trader who just happens to be a chess genius. He ends up being challenged to pit his skills against a malevolent crime boss, but the unwilling participant soon finds the game he is forced to play is far more dangerous than any played out on the 64 squares. Whilst in the early drafts, I wondered whether or not the world champion chess master who had managed to hold the title for fifteen years, would consider endorsing my book. 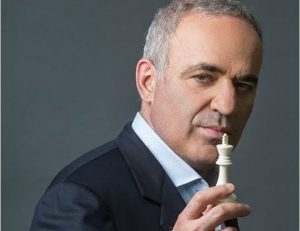 After all, it does mention chess and his name is in the title (he may yet make me take it out) but I felt he owed me: Garry Kasparov had been the cause of so much trouble in my early married life after my wife gave me a computerised chess set. 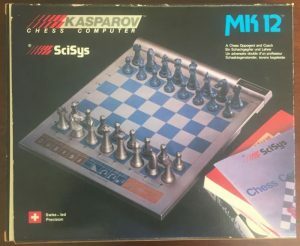 It was in the days when computer chess was in its infancy and the board proudly sported Kasparov’s name and an image of him on the box, looking mysterious and thoughtful. According to his later writings, he had worked with the designers to help pioneer the perfect chess algorithm. I too was thoughtful and mysterious, just like Garry Kasparov: beating a biscuit-tin-shaped pile of semiconductors should be a breeze for a man of my towering intellect. The problem was, that on the intermediate level setting, (not even advanced), the computer roundly thrashed me. I must have played hundreds of games and lost every last one of them, until one day the machine made a stupid move. I couldn’t believe my luck. I quickly took control of the battlefield and won a game against that wretched computer, but my victory was hollow. I started to think that Kasparov’s computer let me win, with the objective of continuity of torture that would make life miserable for the foreseeable future. I played a few more games and lost, before throwing my bricks out of the pram and assigning the computer to the skip. I was starting to hate chess; it felt as if it had ruined my life at the expense of what little free time I had. Thirty years later I found myself writing the book and those early games came back to haunt me. I took some time to research how Garry Kasparov would think. How did he become so successful? Did he have a photographic memory or a genius IQ? In his book, How Life Imitates Chess, I found a number of surprising answers, but I also answered my own question. Would Garry Kasparov endorse my book? No, he most certainly would not! I didn’t need to ask him personally, because he made it abundantly clear in his own writing that he had nothing but contempt for chess players or writers who did not understand how the game was played at a championship level. He considered people who entered tournaments, without the prerequisite skills, to be disrespectful. He felt that writers, and Hollywood in particular, had done the royal game no favours; they had a habit of portraying chess masters as near- crazy people. Oh no! I had written a book about a near-crazy chess genius who had a photographic memory. To be fair, there was light at the end of the tunnel and for once it wasn’t that of an oncoming train. Even the most cursory research quickly revealed a potential candidate for the title of near-insane chess genius with a photographic memory. According to his obituary, Bobby Fischer, a Chicago-born former child prodigy would perplex his fans with angry gestures, decade-long sulks and outrageous outbursts. Fischer gave his title away only three years later to the Soviet champion Anatoly Karpov, after refusing to defend it. He spent years in obscurity before breaking US sanctions to play and beat Spassky in the former Yugoslavia during the Balkan wars. This resulted in him becoming a fugitive from the US who sought his extradition. However, it was the bizarre circumstances of his final years that really earned him the crown. Whilst being of Jewish ancestry, he continued to complain that he was a victim of a Jewish conspiracy. After the 2001 attacks on the World Trade Centre, he gave an interview on a Philippine radio station to say that he hoped that the United States would soon be wiped out. He spent months in a Japanese jail cell, and his final years were spent as a wild-haired shambling recluse after Iceland gave him refuge. He died aged 64. The symbolism of one square of the board for every year of his life did not go unnoticed by Russian chess grandmaster Mark Taimanov, who lost to Fischer in 1971. The deeper I researched, the more candidates for the crazy person chess crown loomed into view. Vassily Ivanchuk or Chucky to aficionados, rarely looked at the board, instead, casting around the room to gaze at the walls and ceiling. He is reported to have broken his toes in a fit of temper when kicking a brick column after losing a match. Another threw himself out of a fifth-floor balcony window. It would seem that chess did not bring great joy to the lives of everyone it touched, or maybe they too had owned a Kasparov electronic chess set, similar to the one that had so cursed me. In the 1980’s computer chess was in its infancy. This is the machine that nearly triggered a divorce. I found Garry’s book both candid and enthralling. Here was a man that had worked his way to the very top and held his title for 15 years. He had given up professional chess at the age of 40 to go into politics and was now taking on Russia’s president Vladimir Putin. Unbelievably, he was willing to share with us how he did it. He comes across as being quite intimidating. He is mentally and physically a tough guy. After reading his own words, I realised that the Kasparov Paradigm was a real thing, although it was a term I had coined in order to write the book. There was a sudden epiphany about the game which I had won but had left still feeling cheated. Computer chess was in its infancy, but he had woven elements of his strategy into the game: unpredictability for one. Whilst I was busy losing my games against Kasparov’s evil machine, his algorithm was learning about me. It didn’t take it long to figure out that my pedestrian style of chess was reactive. I had no strategy. My only goal was to win against the machine. Ironically, Kasparov was to be given a dose of his own medicine when he famously lost against IBM’s Deep Blue, but that is for another story. His book explains the difference between strategy and tactics. Kasparov would have a strategy for every match, starting with finding out everything about his opponent: which style they hated the most and what were their strengths. When he beat Karpov to take the world championship title, his research had suggested that Anatoly Karpov hated slow-moving play, so he would open with a creeping, crushing set of moves: The Spanish Torture. The difficulty was that this type of play did not suit Kasparov either. He favoured more attacking, aggressive play. Karpov would have known this, but it was enough to wrong-foot him. However, another surprising secret was that it was just as important to know oneself; one’s own strengths and limitations because an opponent almost certainly would. I hope that you do have an opportunity to read Kasparov’s book as well as my own, although it may lack the endorsement I craved. You can read it here: (link to be placed when published). 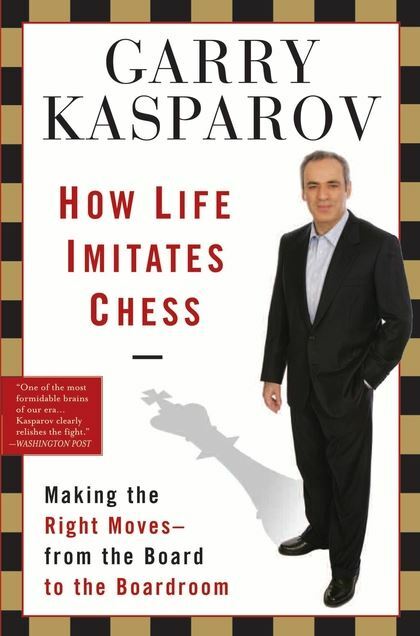 I would go as far as to say that the information Kasparov reveals in How Life Imitates Chess, is invaluable for would-be high achievers. In the manner of all true winners, his approach was always the same: he had a definite strategy for winning every match. He stuck with the strategy even after failure, adjusting his tactics only when he became aware of something that was technically wrong with the approach. Failure was acceptable, provided he understood why he failed, and learned from it. His book contains a quotation from Ralph Waldo Emerson: “A man who knows how will always have a job. A man who knows why will always be his boss.” The why is so much more important than the how, and it would seem a constant source of frustration to Garry Kasparov that the press was only interested in the how. They would ask questions such as, “Do you have a photographic memory?” “How many moves do you think ahead?” “ What do you have to eat before a big match?” Kasparov would liken these kinds of questions to asking a great painter how many brush strokes were there in each of his paintings. The answers had nothing to do with how a great work of art was achieved. He would say that all great chess players were artists, but not all artists could play chess. Another pet hate of Kasparov’s and one which brought a smile to my face was that he hated people who would use the expression, ‘thinking outside of the box.’ If you were going to use anything less than cold logic to solve problems, you deserved to lose. I had always disliked that expression anyway. It would often be espoused by grandiose, self-appointed experts, as a way of hiding the fact that when it came to the subject they were being asked about, they were totally clueless. In my own novel, The Kasparov Paradigm turned out not to be such a fictional concept. It was one of many strategies deployed by a man who knew how to win. 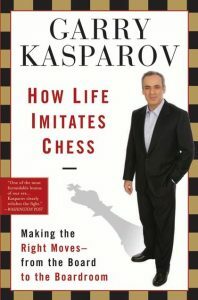 I highly commend Garry Kasparov’s book, How Life Imitates Chess, which you can get here. I hope one day you will have the opportunity to read my own thriller based on one of his tactics. Then maybe you too will be able to judge for yourselves whether or not the premise is true. If you would like to register to receive updates on when a new article is published on this site or wish to pre-order a copy of The Kasparov Paradigm, please click this link. I also welcome hearing your thoughts on Kasparov as well as any insight you care to share about the world of publishing. Just scroll down to the ‘leave a reply link’ below. ← Previous Previous post: It’s NOT OK Google! Look forward to reading it Alastair, but I couldn’t find it on Amazon yet? Food for thought Alistair though I’m hopeless at chess.